One of the strong points of Frank is that the eccentric plot is loosely based on a true story. Another highlight of the film, which should not come as a shock to anyone, is Michael Fassbender (even under a huge papier-mâché head). 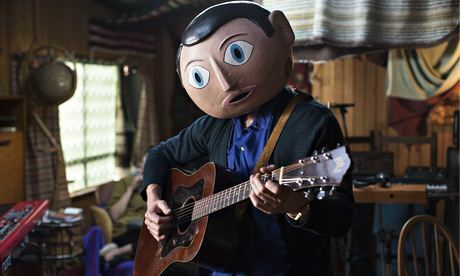 Earlier this year Jon Ronson wrote an informative article detailing his experience of becoming the new keyboardist in the ‘90s rock band The Freshies, fronted by quirky singer/songwriter Frank Sidebottom (alias of Chris Sievey). The film differs from the original story in many ways, as adaptations often do, but all of the changes made for the film seem to benefit the overall story as told in this particular medium. In the film, for example, Jon (played by Domnhall Gleeson) never actually sees Frank’s face until the final portion of the film, which adds to the character’s charm and mystique. Ronson, on the other hand, was quite close with Sievey (and Sidebottom), as apparently he would often go in and out of taking on the papier-mâchéd persona. The film follows Jon, an aspiring songwriter, as he joins the impossible to pronounce Soronprfbs and without much consent spends the next year of his life working on their new album. Jon gets closer and closer to the elusive and alluring Frank, and due to his eventual creative contributions (which gets the undiscovered band as far as SXSW), Jon pushes the members apart. Eventually the band consists only of Jon and a very mentally unstable Frank. Dark comedy is an easy genre to mess up. The films can tend to compensate for the more intense content with over-the-top humor, generally confusing its audience and missing the mark. Frank, however, is able to strike that difficult balance throughout. Its humor is almost entirely spot-on (except for a few jokes that border on unnecessary slapstick) and the film still manages to have a sobering, meaningful message. As the story begins we, along with Jon, are delighted and slightly mystified by Frank’s presence and talent. Slowly, though, his quirks and behavior become not so much whimsical and funny, but sad and unhinged. Jon is intrigued by the small glimpses of Frank’s tortured soul, and wants desperately to find his own version of the presumably rocky childhood Frank had. The final thirty minutes or so of the film slow down. While this might bother some viewers who are used to the quicker paced comedies, the slower quarter of the film seems necessary to handle the delicate reveal of the real man under the oversized, painted head. In a heartbreaking moment we learn from Frank’s parents that no, he had no history of trauma, no terrible childhood, that he just has a mental illness. The film makes no attempt to explain of justify Frank’s condition, as it has no reason to, and instead presents it merely as a fact. This may lose some viewers who perhaps might crave more justification, but it is one of the stronger aspects of the film, allowing it to transcend being bogged down with definition and over-exposition. Choosing to cast Michael Fassbender, a highly talented actor who also is incredibly easy on the eyes, as a character who spends 95% of the movie under an oversized head is a bold choice—one that completely pays off. Instead of the visual restriction limiting Fassbender’s abilities, it seems to give him more room for creativity. He’s able to still charm, elicit sympathy, and be comical without ever going over-the-top. And when we do finally see his face and are given a few brief scenes of Frank without the head, Fassbender remains wholly impressive with his subtle, nuanced emotion. Frank is a simple, impressively witty dark comedy. The plot is undeniably rich with feeling and humor not only due to those involved in the production, but also the film’s true origins. It stands out as easily one of the best among the indie comedies from the past couple of years. 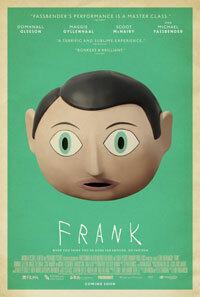 Frank opens in Philly area theaters today.